How Can an Emergency Dentist in Fort Lauderdale Help You? No matter how embarrassing or painful, you can’t always avoid an accident from happening—even to your mouth! Dental emergencies can get very real and even be scary to deal with if you’re not prepared with the proper knowledge on how to identify them, how to treat them, and who to turn to when you need extra assistance, like your emergency dentist in Fort Lauderdale. Learn more about dental emergencies and how to address them in this week’s blog post. How Do You Classify a Dental Emergency? Most patients don’t think to turn to their emergency dentist in Fort Lauderdale when something traumatic happens to their mouth. Why? Usually, it’s because they don’t know that it’s a dental emergency that needs professional oral attention. 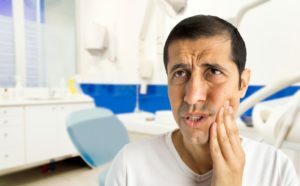 Here’s how you can classify dental emergencies: if you’re in pain, bleeding, any part of your mouth is swelling, or you have a damaged tooth, you’re dealing with a dental emergency. However, there are different types—some that are critical and some that can wait for a scheduled appointment—so it’s best to turn to your dentist for assistance. There are some dental emergencies that are more critical than other ones, like a knocked-out tooth compared to lodged food between your teeth. They both need attention, but the urgent dental accident should receive care right away. Why Should You Turn to a Dentist for an Emergency? Believe it or not, most emergency rooms will turn you over to a dentist when you visit them for a dental emergency. Think about it—most ER’s are full of patients who have a variety of problems—some more urgent than oral emergencies. There’s a higher probability that you’ll be stuck waiting in the lobby for much longer just to find out that there’s no dentist on hand. Then, you’ll be referred to the nearest dentist, wasting time and money. It’s best to call a dentist or visit your regular dentist when facing an emergency to discover the solution that will save your smile much faster. If you need more advice on how to care for your smile, don’t hesitate to reach out to your dentist for help! Here at Mingel Dental, our team wants you to know that we’re here for you in your time of need. That means when something unexpected happens to you or a loved one’s smile, we’re only a phone call away! Don’t hesitate to reach out to our office, we would be happy to help restore your smile. Comments Off on How Can an Emergency Dentist in Fort Lauderdale Help You?